The Sen egal team returned home on Tuesday after a very successful and rewarding mission. This trip was as much about encouraging and building relationships with the people who are doing the daily work in the Pikine neighborhood as it was about accomplishing projects. Some of the team taught English to the teens of the community while another contingent worked hard building the vocational school despite physically demanding conditions. In fact, on the last work day the thermometer topped out at 130 degrees! -but it was a dry heat, Ha! The medical team evaluated and treated nearly 200 patients and had the opportunity to teach in the local hospital. The women in our group led a powerful woman’s retreat for Senegalese Christians in the region. There were many stories of personal breakthroughs and spiritual growth that came out of this event. One of the highlights of the trip for the team was separating into small groups and spending time in the homes of families in the Yoonu Njup church. It was a special opportunity for us to hear stories of their own faith journeys and to share a little of our lives with them. The team is leaving today for Senegal. 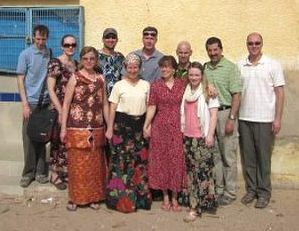 This is an 11 person team with a 3 fold purpose: 1) We will be meeting and getting to know the church families affiliated with the Yoonu Njup Community Center with the goal of encouraging them and establishing connections to small groups in our partner church (South Shore Community Church in Bridgewater and Brockton, MA). The women will also be speaking at a woman’s retreat. 2) We will also engage in community outreach by staffing a small medical clinic and treating people in the community. We will also be connecting with the community through an English class that we will run. 3) Finally, part of the team will be building the Vocational school that will train poor, marginalized boys who would not have access to this kind of education otherwise.